They’ve cooked up a sweet idea for raising money at New Horizons, the North Hills-based non-profit that helps individuals with special needs. The agency’s clients, who have been baking New Horizons chocolate chip cookies for years, are now selling them at the Vons store at 18439 Ventura Blvd. in Tarzana and its sister Pavilions store at 6543 Platt Ave. in West Hills. New Horizons supplies 200 cookies to each store every week. They went on sale April 27, according to the non-profit’s President and CEO Cynthia Sewell. “Vons and Pavilions have been a valued partner of New Horizons for decades,” she said. The partnership dates back 27 years. Over that time, Vons has donated more than $70,000 to the agency and employed dozens of its clients at 13 San Fernando Valley locations, playing a major role in the agency’s Supported Employment program, she said. New Horizons’ clients introduced the cookies to customers at the two stores. 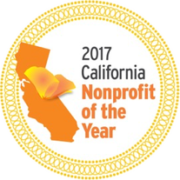 The agency currently has 332 clients working throughout the Valley. The cookies are baked at Sam’s Cafe, the on-site food preparation facility on the agency’s campus. They come in packages that sell for $2.99. “One hundred percent of the profit goes to New Horizons. Vons makes no profit. How great is that,” Sewell said. New Horizons’ clients started baking the cookies in 1982. But they were made in a classroom with just enough space to bake two dozen at a time. In 1988, the agency built Sam’s Cafe — which has a restaurant quality kitchen — to expand the cookie operation. “We also sell the cookies online… And we also deliver cookies to our legislators to keep in touch. And we’ve gotten a lot of support from the community. They are happy to see us in the stores,” Leilani Downer, New Horizon’s marketing and communications manager, said. Carlos Illingworth, Southern California director of communications and government affairs for Vons, a division of the Albertsons Companies, proposed the retailing idea two years ago when the agency was seeking a donation. He offered New Horizons the chance to sell cookies in the company’s stores. To read the article as it appeared in the LA Daily News click here. 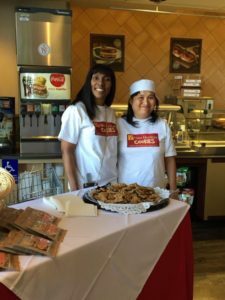 New Horizons staff member Sharoll Jackson (left) and client Nancy Jan at the Vons store in Tarzana with the chocolate chip cookie display.